In India, beggars don't do anything and ask for money. But here, I see this specific practice to ask for money (in foreign countries). Well, it's not limited to playing some instruments. At times, they do better job than professionals. My question is, morally, I feel that the word 'beggar' for the latter ones is quite offensive. What do native speakers call them? Are they still beggars? If so, I'll still need some better alternative to separate them from our beggars in India! I will never call them beggars (because, being an Indian, I have a different image of a beggar). In fact, I respect them more than many professionals I find around me! Note: no charity from the beggars/money-seekers is involved in any case. I would call all sort of artists that are performing in the public for free or donations "street performer". I found another word, "busker", but I never heard of it before. Beggar refers to someone who is unemployed and depends on asking (begging) people passing by for money. Those who do give them money do so out of charity. 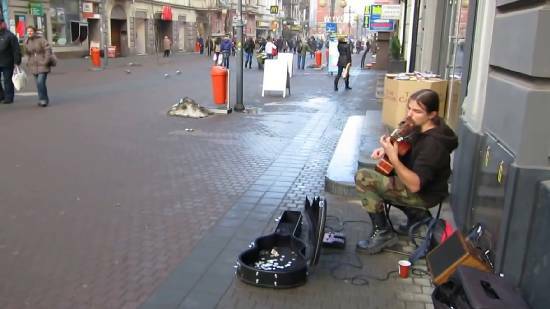 Busker refers to a street performer (could be music, art or drama) who performs for anyone walking by in the hope that many will pay them for their time. It could be their only source of income, or just a side job. Those who give them money do so because they consider the busker to have provided them some valuable entertainment. The OED shows the earliest uses of busk with this sense are from the nineteenth century in Britain. While this doesn't fully explain the inconsistent awareness of the word within the US (as seen in the many comments below! ), its relative recency compared to the divergence of US English does help explain in part why it is more common within Commonwealth English. Someone offering something of value (their art) for money. I would say "street performer" would be the right word for the second kind. It's simple, direct and well understood. A mendicant (from Latin: mendicans, "begging") is one who practices mendicancy (begging) and relies chiefly or exclusively on charitable donations to survive. I first saw this word when I was a teenager. It was in the novel "Citizen of the Galaxy", by Robert A Heinlein, referring to beggars. It also referred to a "mendicant's license", meaning you can stand or sit on the street and not be hassled by the cops if you had a license to beg. Is there any other neutral word for homosexual male than gay? Is there any expression/word for “almost inaccessible”? Is there any oxymoron word for the word “oxymoron”? Is there any word in English to ask for “whichth”? What word describes knowledge interesting for more than one field? Is there any other word for negative species traits?